The new NSF EPSCoR RII grant, Consortium for Innovation in Manufacturing and Materials (CIMM), has been funded. LA-SiGMA's funding is coming to an end. Please visit CIMM's website to learn more about their research and summer REU and RET opportunities. 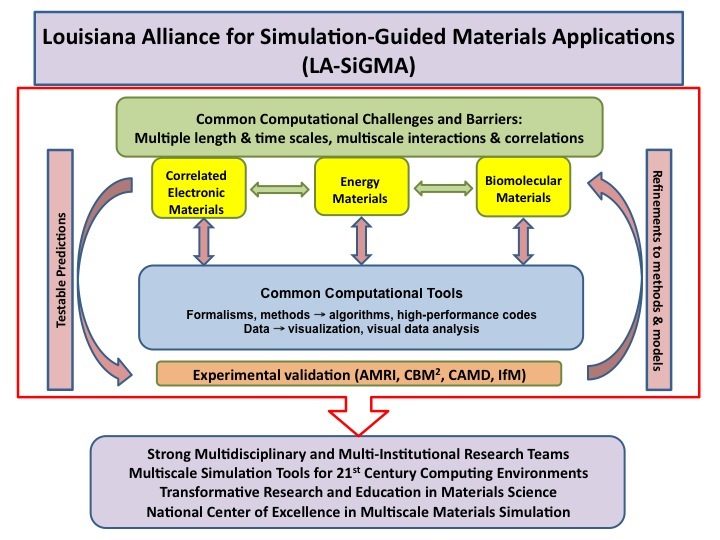 The Alliance pushes the scientific frontiers in computational materials science, and prepares Louisiana researchers to use the next generation of heterogeneous, multicore and hyper-parallel cyberinfrastructure effectively. LA-SiGMA builds statewide interdisciplinary research collaborations involving computational scientists, computer scientists and engineers, applied mathematicians, theorists and experimentalists. Most significantly, the Alliance builds materials science graduate curricula that are unique in its statewide reach and impact, and will be a model for virtual organizations for advanced education and training of graduate students and post-doctoral fellows. Electronic Materials - development of multiscale methods for strongly correlated electronic and magnetic systems; studies of correlated organic, ferroelectric, and superconducting materials. Energy Materials - study of electro-chemical cells and capacitors that store and deliver electrical energy, advanced materials for highly efficient and long-lasting batteries and catalytic reactions for fuel generation. Biomolecular Materials - development of novel biomolecular material systems for the encapsulation, delivery, and release of therapeutics to targeted tissues. The "glue" that holds the three areas together are the formalisms, algorithms, and codes for tackling multiple length and time scales and multiscale interactions and correlations. Among these are the next generation Monte Carlo methods, massively parallel implementations of Density Functional Theory, force field methods, and large-scale molecular dynamics. The Alliance members are: Louisiana State University (lead institution), Grambling State University, Louisiana Tech University, University of New Orleans, Southern University at Baton Rouge, Tulane University, and Xavier University.